Vintage RSVP set for the Vintage Wedding Invitation. Set includes the rsvp card and envelope. A1- called 4 bar size (5"x3.5") RSVP card is 100% cotton cardstock with 100% cotton envelope made by Crane in USA. If you are printing, you get 4 cards on the sheet we send you. (Templates included). Prints inkjet or laser. Paper is cut to size if we print for you. Bright White 50% postconsumer recycled paper cardstock. 80 lbs weight and 8.5x11 inches. You can print 4 direction cards or reception cards on a sheet. 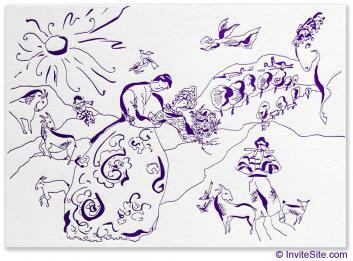 Inspired by Chagall, an Original illustration by Diana Marye which we letterpress print on the front panel of this smart booklet style invitation. Interior enclosure pocket. Letterpress printed in purple ink on crisp white, thick cotton paper. Super clean and polished finish. Booklet is diecut and scored, with a handsome pocket for rsvp set or enclosures. Two panel invitation sheet - perfect for 2 language wedding invitation. Assembly is easy to medium. All cotton paper and envelope. An Eco Design that is oh so Parisian chic. DIY assembly: fairly easy -- less time than if bound with a ribbon. DIY invitation opens to a modern landscape measuring 14 x 5 inches. The invitation sheet attaches to the portfolio with a length of thin satin ribbon that you can tie in a knot or a bow. Chocolate brown ribbon is available. Call us. PAPER FACTS: Portfolio wrapper made from recycled 100% cotton paper, made in USA. Diecut and letterpress printed here in Pasadena. Inside invitation sheet made from 100% cotton paper. Envelopes are matching cotton paper, baronial (pointed) flaps. Open invitation measures 14 x 5 inches. Printing sheet measures 4.5 x 13 inches. Colors: Crisp white,orange ink etterpress vegetable inks. Made in USA: completely eco through and through. Invitation Sheet:White text weight cotton paper, prints laser beautifully. Wrapper:Crane cotton coverstock, letterpress printed, die cut and scored. Envelope: Bright white cotton paper, A7 standard size, baronial (pointed) flap.